Mantissa InfoTech, through its expertise in software development and its experience of working with commodity exchange, offers such software services which could automate a major portion of this activity list, thus, facilitating the smooth conclusion of all these activities. The designing of the software and applications is done in a way that they blend effectively with the humans at work and create an effective camaraderie between the two. In fact, such applications and software guide humans in the work to be done and its process and also apprise them if there is any issue with the software itself. In short, they provide all that a commodity exchange might desire. National Multi-Commodity Exchange Of India (NMCEIL) Limited is the first to get established national level demutualized commodity exchange in India. It is headquartered at Ahmedabad, Gujarat. NMCEIL is a commodity exchange which provides electronic trading platform for Commodity Futures where buyers & sellers can come together to trade and be assured of quality, delivery and payment. The Exchange is promoted by many Government/Semi-Government Organizations including Central Warehousing Corporation, Gujarat Agro, NAFED etc. and many private organizations like Reliance Money, Bajaj Holding etc. More details can be learnt from their website www.nmce.com. Mantissa InfoTech Pvt. Ltd. (Mantissa) is a sole technology partner for every software need of NMCEIL. Started providing services to NMCEIL from 2004 to till date, Mantissa has developed & implemented numerous software applications for NMCEIL including the Core Trading System. This application is used as an extension to Cash Settlement Trading System. The DSS has functions and features which enable the Delivery Based Settlements of the contracts undertaken on cash based Settlement System. The DSS has features to capture the Warehouse Receipts issued by the Exchange Certified Warehouses, and automatically calculate the Storage Charges & Insurance charges based on the Warehouse location and deposit date. It also enables the automatic matching of Buyer & Sellers having outstanding position on the Exchange platform during the delivery period, internal allocation of receipts to the clients of the same members, preferential allocation of the receipts to the clients based on Warehouse Receipt Expiry date or the location of the Warehouse. The DSS also calculates the Delivery Margin obligation, and pay-in and pay-out to the Members settling their positions by delivery on Exchange platform. The DSS has direct link with the Exchange Trading System on one hand and Exchange Clearing & Settlement System and Financial Accounting System on the other hand. This is a unique concept introduced for the Exchange Members. NMG is the ONE STOP SHOP for all the Members for submitting their various requests related to various departments of the Exchange, and for downloading various information through a single interface. Members can submit the Client Details, request for Trader Activation / De-activation, Collateral Addition / Release etc using a single platform. They can also download the Flat Files for the Backoffice, monthly Invoices, and various Software applications through an easy-to-use Interface. It also provides the facility for directly sending the password reset requests to the Exchange, and for auto generation of new passwords. NMG generates a unique ticket number for each request submitted by the Member to the Exchange through NMG, and also acknowledges the receipt of request, and its status to the Member over SMS & email. It also sends the SMS and email to the respective department in the Exchange for the requests specific to the respective departments. This feature enables the automated trading using Calendar Spread Strategy between the two contracts of the same commodity (having different expiry) on the basis of certain pre-defined parameters. This is a full-fledged Financial Accounting System for the Exchange which is integrated with the Exchange Trading System, Exchange Clearing & Settlement System, Delivery System, and Billing System on one hand and various Clearing Banks on the other hand. It provides a direct interface with the Clearing Banks for Margin & MTM pay-in and pay-outs on Daily Basis, and automatically processes the Bank Files for payments received and shortages. It also calculates the penalty on the delayed payments. Development of APIs (Application Program Interface) for the Exchange Trading Application for allowing the Third party software to connect to the Exchange platform in a secured manner without exposing the Exchange application architecture. Using this, Brokers can connect their CTCL solutions, Algorithm Trading applications to the Exchange, and can develop their own front-end trading applications with customized features. This system provides facility to schedule various tasks to run automatically at a predefined time or interval. The exchange uses this system for Automatic back of live database, Generation of various reports from backup database, saving& mailing the generated reports automatically at a pre-defined path and execution of various other daily tasks.As of now, there are about 150+ (and increasing) such tasks are handled by this application. The dissemination of spot and futures prices of agricultural commodities to all agriculture sector participants, especially the farming community across the country has been identified as an important activity in the XIth Five Year Plan by the Planning Commission. The Forward Markets Commission (FMC), as the regulator of the Commodity Futures Marketthen in India, has been given the mandate for implementing the directives of the Planning Commission for dissemination of agricultural commodity prices across the country. In response to this directive, the Forward Markets Commission formulated the Price Dissemination Scheme which is being implemented by it across the country in partnership with the Department of Agriculture and Marketing, Ministry of Agriculture, and the five National Commodity Exchanges – The Multi Commodity Exchange of India (MCX), The National Commodity Exchange of India (NCDEX) National Multi Commodity Exchange of India (NMCE), India Commodity Exchange (ICEX) and the Ace Derivatives and Commodity Exchange Ltd. (ACE). The Price Dissemination Project envisages placement of electronic price ticker boards in mandis / APMCs which are networked under the AGMARKNET project for the display of physical and futures prices of agricultural commodities. The project would be implemented during the 11th Plan, with the objective of covering all the APMCs networked under the AGMARKNET project, which at present is around 2500. The project would be implemented by the FMC and the five National Exchanges – MCX, NCDEX, NMCE, ICEX and ACE – in coordination with the project team of AGMARKNET under the overall guidance of FMC. 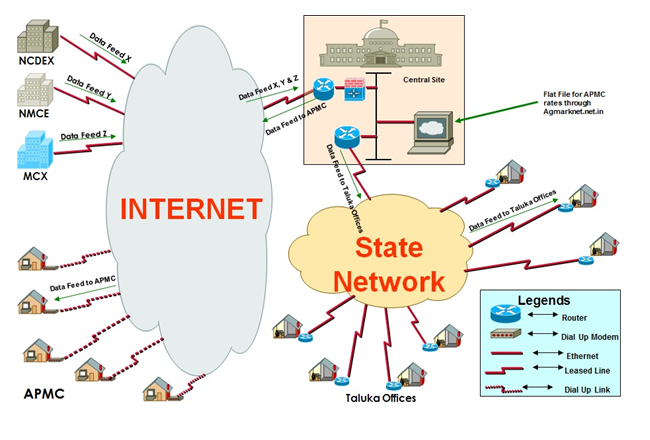 The National Exchanges would upload physical market prices (AGMARKNET prices and spot prices) and futures prices of agricultural commodities discovered by the Commodity Exchanges on a real time basis into a central server at the Exchange from where it would be transmitted to the APMCs via the internet / leased line. These prices would be available on PCs placed in the APMC’s premises. The futures and spot prices of the five Exchanges and the spot prices of AGMARKNET would be run on price tickers placed in the APMC premises connected to the APMC PC in the local language. The Central Site Software for Price Dissemination Project automatically receives the latest Futures & Spot prices of various Commodities from various National Commodity Exchanges, and also receives the Spot prices of various commodities traded at APMCs through AGMARKNET. It collates the information received from all these sources, and then converts it into several regional languages. It then disseminates the information to the several APMCs across various states. Each APMC can have its own data profile with preferred display language and Commodities for which the prices are to be displayed on the Electronic Ticker Boards placed at respective APMCs. The remote site software works in conjunction with the Central Site software. It receives the datafeed for the respective APMC as per the configured profile, and then displays the same on the locally placed Electronic Ticker Board. The Billing System has been developed for the generation of various kinds of bills (like Bandwidth Bill, Transaction charges, Annual Subscription charges, Annual Maintenance Charges etc.) on monthly, quarterly & yearly basis. It’s also keep tracks of payments received and outstanding. SMS query service facilitates various market participants to have ready information on the movement of commodity prices on a real time basis. In addition to enabling the clients to participate more effectively, this service also helps in widening the scope of information dissemination. It provides live updates on the movements of the commodities futures traded on the Exchange to its Members & their traders, thus enabling them to keep a tab on Futures prices even while they are traveling or out of office. For querying the Futures prices for all series of a particular commodity: The user can either key in the code for the commodity or the name of the commodity in English or Hindi. For example, for knowing the Futures prices for all series of Pepper, the user has to send SMS to the above mobile number by typing the word “PEP” or “PEPPER” or “Kali Mirch”. In reply, the system would automatically send the Last traded price for all series of Pepper, with an abbreviated comment on the kind of movement against each series. Same is the case with other commodities such as “Gold/Sona” or “Silver/Chandi.” etc. Price Alert System is yet another extension to the SMS Query services. The registered clients can set customized alerts, which would be valid till the expiry of the particular, contract or till the cancellation by the user himself, whichever is earlier. The clients are able to get the market rates on their mobiles automatically at regular changes without sending the query to the SMS services. The alert message would include the Previous Close price, Day’s High & Low prices, Last Trade Price and the trend/difference in comparison to Previous Close Price. Membership Information & Management system automates the entire process flow of Exchange Membership right from the admission of new Members, transfer of Membership to the surrender of Membership. It keeps the Track of various documents received from the Members for activation, transfer or surrender, and the documents pending to be received. It also provides the Member information to the regulator in the prescribed format from time to time. The system also has in-built Document Management System for managing various Member data in the Electronic format. The Trade Verification System enables the Client to verify its trade details through the Exchange Website. Using this facility, a client who has received a contract note from a trading member of the Exchange, can check whether the trade has been executed on the Exchange, and whether the price printed on the contract note is the same as Traded price or not. 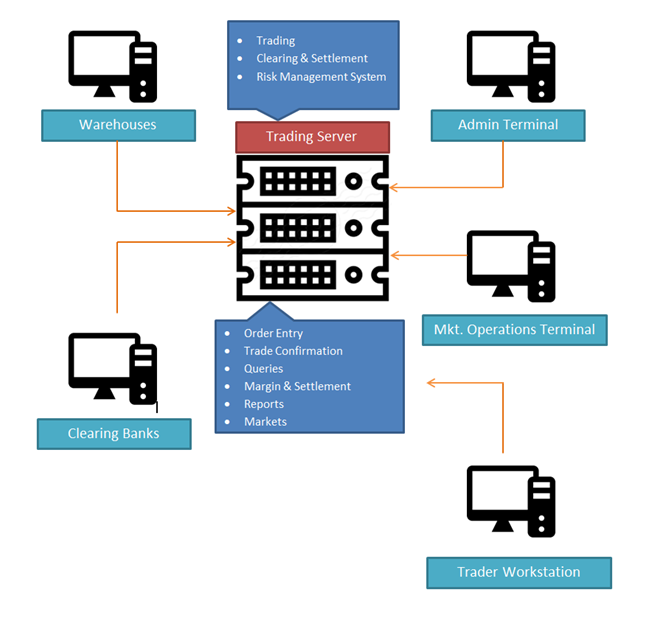 The Client Workstation is a subset of Exchange Trader Workstation. The Client Workstation application in conjunction with the Client Workstation Host Server hosted at the Exchange end enables the Client level access and the Risk Management. The Clients can use Client Workstation application for directly trading on the Exchange platform without the need for a CTCL solution. This application provides real time market data feed to various data vendors like Ticker plant, Reuters and many more over Internet/VPN, Leased line etc.